Crayola Play 'N Fold Art Studio Just $24.99! Down From $40! You are here: Home / Instagram / Crayola Play ‘N Fold Art Studio Just $24.99! Down From $40! Crayola Play ‘N Fold Art Studio Just $24.99! Down From $40! Your kids would surely love this deal! Toys R Us is currently offering this Crayola Play ‘N Fold Art Studio for just $24.99 down from $39.99 PLUS FREE store pick up of FREE shipping for orders over $29! Help your little one explore the wonderful world of art with the Crayola Play ‘N Fold Art Studio, which features a two-in-one desk and easel for playing in a variety of ways. The magnetic dry-erase board can be drawn on with dry-erase markers or used to play with the fun magnetic letters and numbers (markers sold separately). A paper clip at the top of the easel can display your little one’s masterpieces, and an elevated storage area helps keep art supplies, including crayons, markers and more, nearby. The durable stool is comfortable for your little artist to sit on. 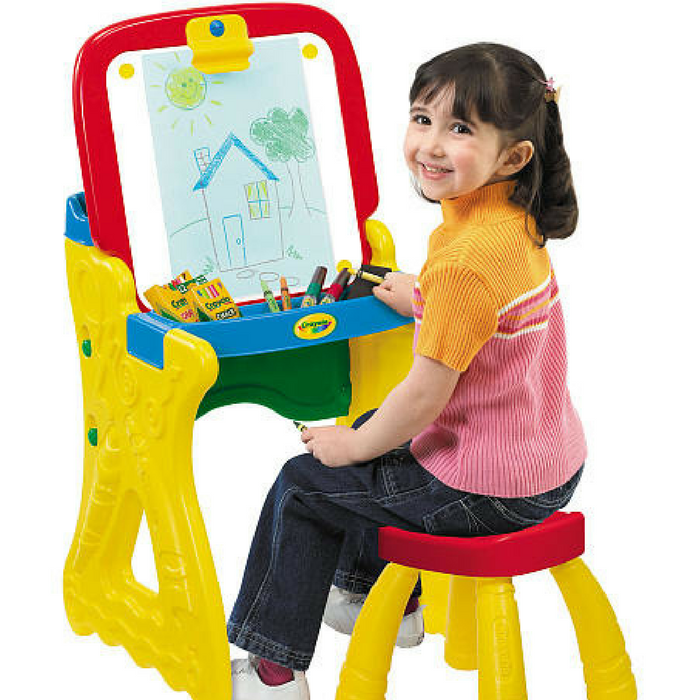 Convert the easel into a desk for ease of use when your child is writing or painting. Recommended use (stool): up to 50 lbs. Filed Under: Instagram Tagged With: Crayola Play 'N Fold Art Studio Just $24.99! Down From $40!